Our Hansel & Gretel cabin now features an outdoor hot tub! Choose the perfect cabin for your next getaway. Will it be the enchanting Castle Genevieve, the charming Hansel & Gretel, the magical Brigadoon, or one of our lovingly restored historic cabins, complete with antiques? We have two pet friendly family cabins (located off campus) so your four-legged friends can enjoy vacation also. 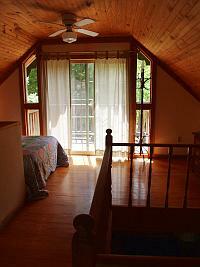 These cabins are also self-contained and fully furnished. We supply it all -- except for food and beverages. It's as simple as we can make it! Just bring your family, grab some food, and let the adventure begin.